Up your game in the garden at Canada’s biggest and best celebration of flowers and gardening, opening for its 20th season today at the Enercare Centre at Exhibition Place in Toronto. With unique events, beautiful exhibits and a series of seminars covering everything from raised bed gardens to useful critters you want living among your plants spread over 10 days heading into spring, Canada Blooms is the country’s preeminent festival of horticulture. To get the most out of your visit to Canada Blooms, Terry suggests the following 10 “must-see” installations at this year’s show. 1. Toronto Flower Show. Hosted by the Toronto Flower Club, the Flower Show brings together the finest amateur floral and horticultural designs. 2. Feature Gardens. More than 25 renowned garden architects and builders are putting together unique designs that will inspire home gardeners with their innovation and ingenuity. 3. Bayview Flowers Floral Alley. In keeping with this year’s Let’s Party theme, Bayview Flowers Floral Alley will feature six unique gardens all representing a significant milestone in life. 4. Alice in Wonderland Wine Garden presented by Canadian Gardening Magazine. Double the size of last year’s wine retreat and drawing inspiration from the timeless Lewis Carroll story, the Alice in Wonderland Wine Garden is the spot to kick back and relax amid the flowers and plants. 5. The Garden Marketplace. Up to 50 exhibitors offering accessories and tools that will help you build a better garden. 6. Plant and Product Showcase.Back by popular demand, the Plant and Product Showcase is one of the highlights of Canada Blooms. The Showcase features equipment, innovative products and a number of plants, including the new plant varieties for the 2016 season. 7. Small space gardening. Brampton Brick brings six ideas for landscaping small spaces like those found in front of a townhouse. 8. Canada Blooms Rain Garden. Conservation and re-use are key to achieving an environmentally sustainable society, and the Canada Blooms Rain Garden at Canada Blooms is loaded with ideas for better using and re-using rain water in your yard. 9. World of Mulch. Create better and more sustainable gardens with compost-based soils covered with natural bark mulch. Presented by Gro-Bark, Ontario’s leading producer of mulch. 10. Garden education. Don’t just attend Canada Blooms to view the eye-catching gardens; gain a little knowledge while you are there, with more than 200 seminars on three stages spread across 10 days. 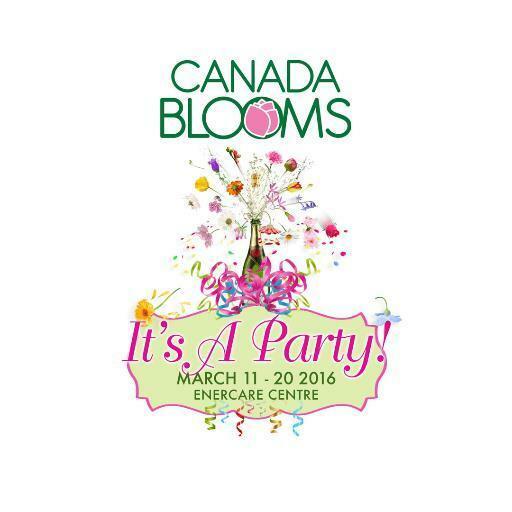 Co-located with the National Home Show, Canada Blooms takes place March 11th to 20th, 2016, at the Enercare Centre at Exhibition Place in Toronto. For more information or for tickets, please visit canadablooms.com. Follow Canada Blooms on Twitter @CanadaBlooms and Like it on Facebook. Canada Blooms is an annual world-class festival that connects people to the joys and benefits of nature through experiences with gardens and flowers by promoting, educating, inspiring and celebrating all aspects of horticulture. A not-for-profit organization that gives back to the community throughout the year by funding community garden projects around Ontario, Canada Blooms is also dedicated to providing the community with horticulture expertise, education and resources on an ongoing basis. Now in its 20th year, Canada Blooms was founded by Landscape Ontario and The Garden Club of Toronto. Each year it is supported by a committed group of partners, sponsors and volunteers. Canada Blooms has been named One of Ontario's Top 100 Events by Festivals and Events Ontario and One of North America's Top 100 Events by the American Bus Association.